Service Connected Sleep Apnea: it Ain’t a Scam…it’s a Typhoon headed for the Veterans Community. There’s this myth out there that Sleep Apnea is not a “real” medical condition, or that by filing a VA Sleep Apnea claim you are somehow scamming the system. 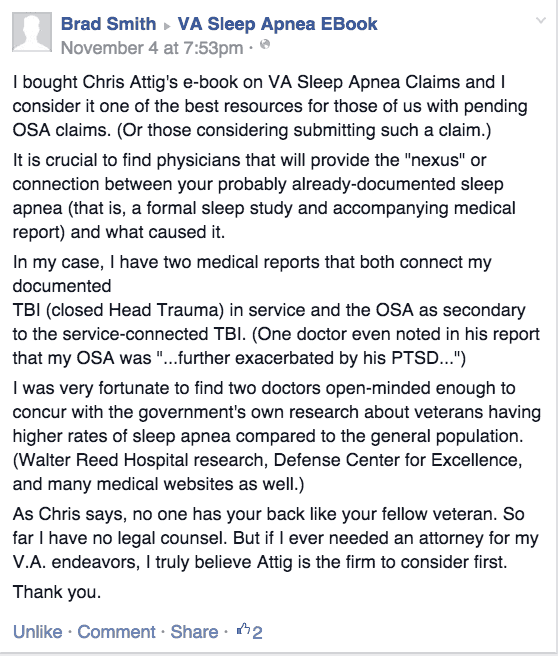 Because of the popularity of my VA Sleep Apnea Field Manual, I started a new Facebook Page where Veterans can discuss Sleep Apnea, sleep apnea and the VA claim, how sleep apnea impacts the Veteran, and to share the successes and failures that they have had in their Sleep Apnea treatment. It wasn’t long before a couple posters – all of whom had no medical training – started ranting about how Sleep Apnea was a scam – that it wasn’t a real military injury like losing your legs or having shrapnel embedded in your arm. Let’s get something straight: VA Sleep Apnea is a Real Problem! #1: Sleep Apnea is NOT a disease of the Obese. There are 3 different types of Sleep Apnea, and about 3 dozen different medical conditions that can cause a soldier to have a later sleep apnea diagnosis. A closed head injury, commonly known as a Traumatic Brain Injury, can disrupt the way the brain and the rest of the body communicate. Just like dropping your computer on the ground will mess with its ability to function, a Traumatic blow to the skull (what we in the military call the Brain Housing Group) can seriously disrupt the body’s sleep breathing mechanisms. Damage to the air passages – from the nose/mouth all the way to the lungs – can disrupt how the body gets and processes oxygen taken in during sleep. Just like a blocked air hose in your car can cause it to stop running, blocking the air passages in the body will affect your body’s ability to breath while it sleeps. #2: Service Connected Sleep Apnea is NOT a Scam for Veterans to get more money from the VA.
For this myth, I blame Florida Family lawyer Michael Webster who, without any medical or scientific basis, and relying on a couple cases he had in the family law context, concluded that Sleep Apnea claims are filed by frauds. I want to meet – and debate – this clown. But he doesn’t respond to my requests for such a debate – which tells me how little confidence he has in his assertions. In fact, in April 2015, his “best friend” and alleged client – and allegedly a military officer – confronted me after a Sleep Apnea Conference, telling me that Mr. Webster would debate me and sue me for defamation (for calling him a clown, I suppose). Since then….crickets. Bottom line – forget the trolls – there are a LOT of Veterans that suffered like you. And a lot of Veterans got help. If you believe that your sleep apnea is related to your military service, here is how you can find out the VA Rating for Sleep Apnea. #3: If you have a Sleep Apnea diagnosis and a CPAP, Veterans automatically get a 50% rating. While true that to get a 50% rating for VA sleep apnea claims you must have a CPAP machine, proving service connected sleep apnea can be a bit of a challenge. In my VA Sleep Apnea eBook, I point out that 3 out of every 4 Veterans that filed a VA Sleep Apnea claim were denied in 2013-2014. I figured out the reasons for this, and share it with Veterans in the book. After talking with many Veterans, and reading hundreds (if not thousands) of BVA Sleep Apnea decisions and Veterans Court decisions on VA Sleep Apnea Claims, I identified 4 very common scenarios that lead to denial of VA Sleep Apnea claims and appeals. I show Veterans, in the book, how to deal with each of these 4 scenarios. 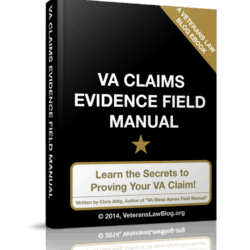 I also point out how Veterans can avoid making some of the very common mistakes that occur in a VA Sleep Apnea Claim. #4: Service Connected Sleep Apnea does not cause other problems for Veterans. Many Veterans file a VA Sleep Apnea claim, and when they win, they stop taking action. This can be a big problem for a Veteran. Why? Because service connected sleep apnea is like a rock dropped into a pool of water – the ripple effects can last a lifetime. Sleep Apnea can Cause Heart Disease. Sleep Apnea is Connected to Strokes. Sleep Apnea can Cause Liver Disease. The American Academy of Sleep Medicine released a study in May 2015 that Sleep Apnea is highly correlated in 69% of Veterans with PTSD. What To Do if You Want to Service Connect Sleep Apnea? Read some of the resources on Veterans Law Blog – click on the links below to learn more about service connected sleep apnea claims and appeals. Join Veterans suffering from Sleep Apnea on this special Facebook Page. 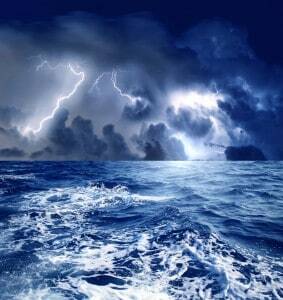 Check out my eBook. 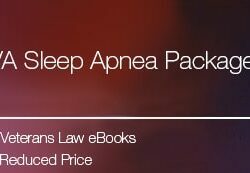 It is THE comprehensive resource for Veterans trying to win their service connected sleep apnea claims. 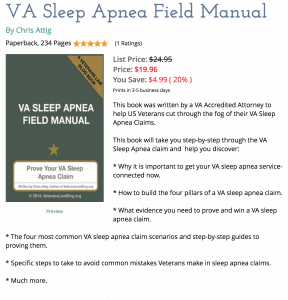 You can purchase your individual copy here – or check out the VA Sleep Apnea Claims Guidebook Bundles – priced at a discount to help you learn how to service connect sleep apnea in your VA Claim. 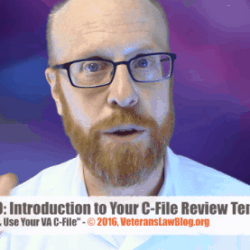 Or, if you are so inclined, purchase ALL of the Veterans Law Field Manuals and Training Videos, and get a 50% discount on the Veterans Law blog, too! Thank you for helping. I have OSA, my wife is a Doctor although no longer in practice. A fellow named Jim who had and I think has a popular blog told me I am scamming because I have questions about OSA. I can say I was within weight standards while on active duty and wish people would learn about thyroid issues and hormone issues before displaying such ignorance. Jim is not a doctor but has PTSD and brags about riding a bike cross country maybe that is a scam.